Traditional Quinta with guest villa near Sintra. Maid service included. Enjoy a family holiday at Quinta da Luz which is a mansion house estate that has been in the Luz family for seven generations. The whole property covers two hectares and guests are encouraged to roam on it at will. A large pool and pool area, beautiful gardens, vegetable plots and orchards in a green secluded valley, all make for an enchanted visit. Ideally situated in the old village of Rio de Mouro, just a ten minute drive to fabulous Sintra with its fairy castles and wonderful walks, World Heritage Site. Also within a twenty minute car ride to stately Lisbon, the coast, also twenty minutes, with its beautiful beaches and old fishing towns. Close to several world class golf courses, a riding school, bicycle hire, surfing beaches, good restaurants and a gym. Also close by, convenient supermarkets, post office, bank and medical centre. A qualified masseuse will come to the villa and also a baby sitter can be arranged. The owners, who are English, are usually on site to provide any assistance, advice and suggestions. Guests will be provided with spare organic fruit, vegetables and herbs from the garden, and Elisabete, our English speaking maid will come in on week days to do some cleaning as necessary. Guests usually divide their time by relaxing by the pool and visiting the attractions within easy access from the Quinta. The guest villa itself is for a maximum of five persons with a good cot with cot sheets, a blender, stair gate and a selection of toys for the little ones. On two floors, the whole villa covers approximately 120 sq.m. with a good living area with a wood burning stove, a tv with satellite reception and over two hundred channels and a good selection of novels. There is a dining area on a split level and the kitchen is also large with an eating area, also leading directly onto a private patio with a BBQ and table and chairs for eating al fresco. There is a closet with an ironing board and oven downstairs. Upstairs are two bedrooms, one very large en suite with four windows and plenty of closet space. The second bedroom is a also of a good size also with good closet space and two windows. The whole villa is light and airy with ten windows and with wi-fi throughout. The old caretakers house has been completely refurbished and tastefully decorated with comfort in mind. Paintings from the owner adorn the walls, and there is also a painting studio on site with materials should you be tempted to sketch or paint. Described as an oasis by many visitors, enjoy a traditional experience in the old Portuguese style. We have three very friendly dogs who enjoy having a fuss made of them. Susan and her mother, Paula, have lived on the farm for many years. Little by little it has been adapted and renovated. We ran a language institute for over twenty years, and now Susan still does some translation work. Paula is retired now, but still takes an active role in the running of the estate. Paula is originally from Poland and was naturalized British when she arrived just before WW2. Susan is widow of a Portuguese national and has been in Portugal since 1967 and loves the country. Both speak Portuguese, and Susan also speaks French. She enjoys painting and also writing. Another of her hobbies is Bridge. Paula is in her ninetees but is still active cooking, making jams and chutneys and being on the computer, not forgetting tending to her dogs. We both very much having guests and have had the privilege of meeting some wonderful people. We both love living in the Sintra area. We are so near to Lisbon, Cascais and Sintra itself - so convenient yet we are in a little oasis. Although we are very secluded here we have everything we need at a short distance. 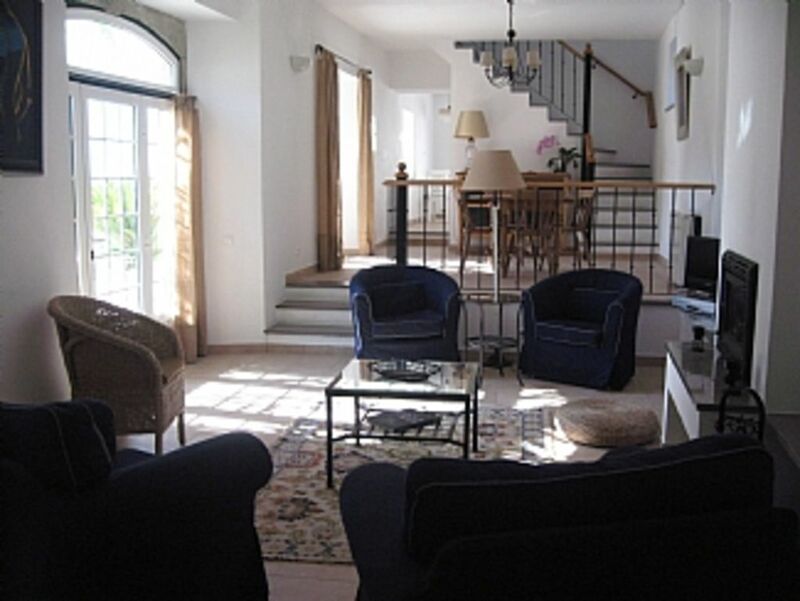 Quinta da Luz is a large property and once inside feels like it is in the countryside. There is a strong sense of space, and the gardens flourish under the loving care of Paula. Being in a valley with no other houses in site, we have the advantages of the country, but we are not at all isolated. Within a short distance visitors find plenty to do and see. Quinta da Luz was originally a wine producing concern, and in the old adega can be found vats which originally held 27,000 liters each. Plums and oranges were also sold in quantities. There is still an old artesian screw and a very large tank for watering which collects the intake from another property via an old tunnel system. It is now home to water lilies and goldfish. Fruit trees abound and on the hill pertaining to the property pines which were seeded by the owners. The guest house was the original edification prior to 1755 when Lisbon suffered a large earthquake and tsunami. The main building is post 1755 in the Pombaline style which came about to withstand future disasters. En-suite bathroom to bedroom 1. Bath/shower, wc and bidet. 2nd bathroom shower, wc and bidet. No air conditioning but due to the very thick walls the villa is cool in Summer. Heating throughout, including the kitchen. Wood stove in the living area, logs provided free of charge. Sheets and cot sheets provided. Changed once a week. Ironing board and iron also provided. Parking within the property just outside the door. Towels provided. Changed twice a week. Pool towels also provided. Wood provided for guests free of charge. Large, open plan and well furnished. Split level, dining/living area. Dining table seating 4, dresser on upper level. Downstairs seating for 5, desk, LCD TV. Log fire. Internet access. Filter coffee machine and expresso coffee machine. Large selection of dishes and utensils covering almost all necessities. Very well equipped, with cooker, hob, oven, coffee machine, kettle, large fridge/freezer, washing machine, dishwasher and microwave. Complete with full utensils. Seating for 4. Access to private patio for dining with BBQ. Dining area separate from living area, split level open space. Selection of DVD's in living room in English. Selection of books in English in living room. Well kept gardens surrounding the buildings. Pond with fish. There are several excellent golf courses within a short drive. Penha Longa, 3 miles. Pestana Beloura Golf Course, 3miles. Estoril Palacio Golf Course, 6 miles. Quinta da Marinha, 8 miles. Belas Clube de Campo, 8 miles There is an excellent road network to these World Class Courses, and the owner has all the information you may require, including green fees. Quinta da Luz more than exceeded our expectations. Everything about it was great from the beautiful accommodation and the clean pool to the lovely garden from which we were provided with fresh vegetables. The only down side was having to leave! Quinta da Luz is a perfect base to start a holliday around Lisbon. We were surprised when we saw the accommodation: it was more beautiful as we expected. We had a warm welcome, Susan and Paula are very sympathetic lady´s. They made us feel home immediately. The house is very comfortable and conveniant for the children. In the morning they collected oranges and grapefruits in the beautiful garden and they loved it. But the three dogs have made their holliday really nice. The guest house is well-maintained and very spacious, with a large kitchen, a separate dining room, and a large living room with a fireplace (which we used frequently during an unseasonably cold April). The bedrooms are also large, with comfortable beds. The bathrooms are big, with one an ensuite to the largest bedroom. We were a family of four (two parents, an 11-year-old, and a grandma) and found the accommodations to fit our needs perfectly. The house would also work well for a couple with several children, or two couples. We did not get a chance to use the pool (too cold when we were there), but it's big, and our daughter was rather disappointed not to give it a try. Susan is an accommodating host, and gifted us with a bottle of wine and a jar of homemade marmalade during our visit. Her dogs are lovely, and very well behaved, and were very good with our (admittedly dog-mad) girl. The guest house is located just minutes from Sintra and Cascais, and only a short distance from Lisbon. When driving to Sintra (especially if you're going to Pena Palace and the Moorish Castle), you will want to arrive by 9:30 a.m. in order to find parking near palaces Parking is at a premium anywhere else in town, for that matter, as it's a medieval town with narrow streets, and parking spots go quickly. Cascais is lovely, and we recommend giving the museums a try (we especially liked the the small modern art museum -- it's excellent) and the large woodland park near the old fort (there were peacocks and lots of flowers). You can also walk for several kilometres along the sea wall towards Estoril, which we found quite lovely. The drive up to Cabo da Rocha is gorgeous, as is the cape itself (most western point in continental Europe). We arrived at Quinta da Luz and "impressed" does not do justice to this little piece of heaven. The house has the most restful ambience with light filtering in the various windows at different times of the day, complimenting its character. Our grown up daughters commented that it was the loveliest place we had ever stayed in. The house is absolutely spotless with eveything you need to make your stay comfortable. The fresh towels and bed linen were most appreciated. The outside is aflow with beautiful flowers and the pool area is private and so relaxing. The little patio off the kitchen was a sun trap and lovely for lunch and dinner. Thank you Sue and Paula. We loved our stay and the beautiful plums and pears from the garden that were delivered regularly. We like clean toilets and a handy location. This lovely villa delivered effortlessly on both. The villa is just a 7 euro taxi to Cacem where we got a direct train to Lisbon (or yo can park and ride). It is also a short drive to fabulous Sintra (get a tuk tuk up the hill) and very well placed for the local beaches and resorts. Comfortable, very private, definitely quirky, and a tiny little bit rustic at the edges, we would all happily return in a flash. As advertised the friendly dogs are part of the package. Sue and Paula (star attraction) were generous, courteous and full of fun. Go for it! We had a very pleasant and relaxing week at Quinta da Luz. The wonderfully restored farm is set in its own mature grounds: a mixture of cultivated plots, mature orchards and old trees, not to mention the beautifully landscaped swimming pool. An absolutely delightful idyll, hidden yet close to (and admittedly surrounded by) developments of greater Lisbon, and so conveniently located to all points of interest near and beyond Lisbon -- Sintra, Cascais, Estoril, Cabo da Roca, Mafra... and further afield (ie day trip distance) to Obidos, Alcobaca and Batalha. Very helpful hosts Susan, Paula and Antonio provided everything we needed -- we couldn't have asked for more. In a word, superb! This area close to Lisbon is surrounded by a river estuary and a large variety of sand beaches all within a short drive.Just west are the outstanding hills of Sintra marvelous for walking among the pine forests. Sintra itself is a gem of a fairy castle, old Mourish ramparts, extensive parks and a lively centre with cafés and restaurants. It has a mystique never to be forgotten. Also nearby is. Queluz Palace modelled on Versailles with extensive grounds.. Where the river estuary meets the sea, there are several lovely beaches and a bicycle track with bicycle hire. As far as sport is concerned, there are seven good golf courses within a short drive. There is a very good riding school quite close by, and another where guests may ride into the Sintra hills. Nearby is Praia Grande, a good surfing beach, and it is possible to hire bicycles to ride into the Sintra hills. Within a 30 kilometre drive, is Setubal estuary where guests may go dolphin watching. A 70 kilometre drive takes guests to the well preserved medieval town of Obidos. The Quinta is very centrally placed with a good road network to Lisbon, the coast, and Sintra, just five kilometers away. There Is a wealth of amenities nearby, several good supermarkets and a shopping mall within 1 kilometer with a hypermarket, bank, a good food court, international shops and cinemas with films in English. Lisbon is a colourful city, lively and frendy..Be you interested in history, museums, art, music, eating out, visitng fairs or just strolling to imbibe the local colour, Lisbon is not to be míssed. Cascais, on the coast, has an international flavour, with many well known fish restaurants and fabulous beaches.